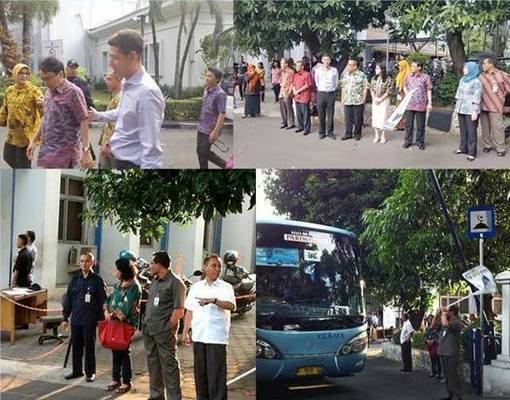 In the moment of Eid Mubarak, PT Otto Pharmaceutical Industries and PT Pertiwi Agung as the member of Mensa Group, in collaboration with BPOM RI, provide 2 BIG BIRD buses in order to support homecoming for the big families of BPOM RI to Central Java and East Java. The departure ceremonial officially released by Dr. Ir. Roy Alexander Sparringa, M.App.Sc (Head of BPOM RI), Echelon 1 and 2, and also Koperpom as the event organizer which formally appointed by BPOM RI. Mr. Jonathan Sudharta, Mrs. Sri Muniarti and Ms. Dianne as representatives from Mensa Group was also attend this event.